Trick or Treat with an Agent starts tomorrow! The rules! Submission window opens at 11AM EDT (NY time) on October 24th. All emails sent prior to the submission window will be deleted. Step 4: In the body of the email, include your 3 sentence pitch, Answer to question 1, Answer to question 2, and the first 200 words. Please leave your name/contact info at the bottom. Those who make the first 150 entries after 11AM EDT on October 24th and follow guidelines will then receive another email letting them know they made it into the contest. Please note this may take some time to receive. Agents will request “candy” in the comment section. Any kind of sugar candy (Skittles, Starbursts, etc) means you’ve gotten a partial request and chocolate candy (Snickers, M&Ms, etc) means you’ve gotten a full manuscript request. Agents can comment on as many entries they like. AND multiple agents can request on the same pitch, so you might find your bag full of treats! Costumed agents will be revealed at 6PM EDT on October 31st. Anyone who receives candy, should email into trickortreatwithanagent@gmail.com for further submission instructions. You will then receive an email with the correct submission guidelines to follow. DO NOT contact the agent without getting the guidelines first. Please No Commenting on the pitches. This is an Agent Comment Only contest. I might be very stupid (a high possibility there) but what are Question 1 and 2? I don’t see any questions. What am I missing? Help! 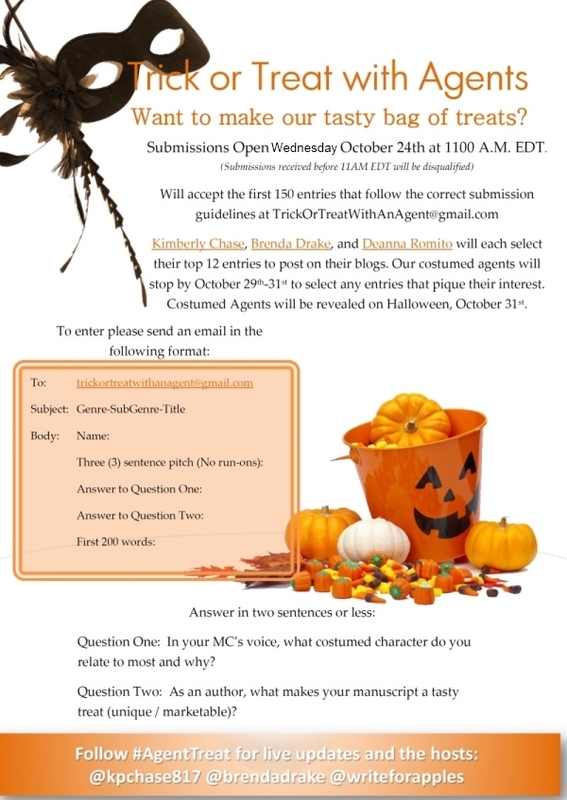 Oh and in regards to question one – do you mean which costumed character as in which one of the agents, or just which costumed Halloween character in general. Such a great and fun contest. I will try again… If anything, I am persistent. LOL. Hope all is well with you. Thanks for the contest!Is there a character count for the sentences? I don’t think I have run-ons, but they’re long. I’ve been working on my entry for two weeks, so I hope to make it in this round. The agent wish list is right up my alley and hopefully, my manuscript will be right up the agents WISH LIST!!! hehe! Darn. I was going to enter, but I draw a blank at what’s meant by ‘costumed character’ and, apparently, my story isn’t unique or marketable. My best guess as a reader of this blog, is that question 1 means what costumed character would the main character of your story relate to? Costumed character could mean anything you might dress up for Halloween. As for unique and marketable, I’m sure you can come up with one facet of your story that makes it stand out. Good luck! Yeah, what she (Stephsco) said. These contests are great and a fun way of getting your writing critiqued. Meeting and supporting other writers and a great way to build connections. I’m on phone and it’s freezing up or I’d go on. Thanks for hosting, Brenda! This looks like one big mess on my draft email. Do you want us to ‘title’ each part. i.e. put ‘pitch’, Q1, Q2, etc? I got a tweet from WritesForApples which said ‘yes, please!’.